Yesterday morning instead of eating our usual bowl of oatmeal, Elliot and I had a muffin at Pine Lake on the grounds of the Chapel of Divine Mercy. I had my camera with me as we sat in the car eating breakfast. 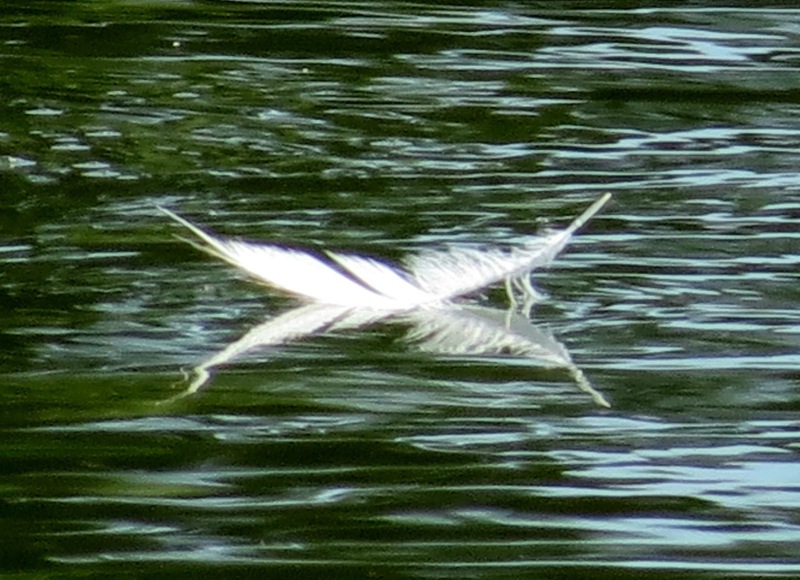 Gazing out at the rippled waters, I thought I saw a white feather floating in the current. 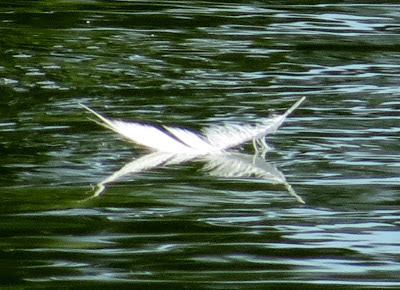 Far off on the lake, it did seem unlikely that I would spot a feather, but knowing white feathers are a sign of angels, I continued to watch it bob up and down. Not trusting my own eyes, I decided to ask Elliot if he could see it. "Looks like a feather," he said. "I thought so!" I smiled, hopping out of the car in hopes of getting a photo. With the zoom lens, I was surprised to find not one white feather, but two! The pair had apparently crossed each other on a lake-faring journey, forming the letter "X". Snapping away with the camera, I wanted to make triple sure I captured the white feathers. I even asked the angels for help as the pair elusively danced on wavy ripples. To my surprise, a trio of sand hill cranes landed beside me. That would have made a nice shot, too but my timing was off. When I got home and uploaded the photos, I had to smile. Only the first photo of the white feathered duo had turned out. I had learned a lesson to trust that you will be given what you need. Curious, I did a little research on the meaning of white feathers. White feathers represent higher thoughts. In dreams, they indicate innocence or a fresh start in a spiritual sense. The letter "X" represents the cross and Christ, and is also a symbol for change or transformation. Since X represents the Roman numeral ten (yud in Hebrew), it also means manifestation. The fact that the two feathers had teamed up suggest a union of opposites or equilibrium: As above so below, male and female, heaven and earth.